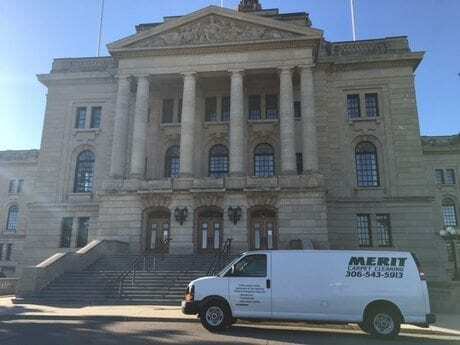 Merit Carpet Cleaning started from scratch more than 31 years ago. Our previous proprietors, Barry and Gloria, established our company as a small business. The partners, renowned for their hardworking nature, earned an excellent reputation among the local people over the years. Soon, positive word of mouth about our services spread across the community, transforming our humble operation into a stable business in Regina, SK. Kipp, our current owner, decided to buy Merit because he was impressed by the way that Barry and Gloria managed our business. Furthermore, Kipp was amazed at how many repeat customers Barry and Gloria have earned since our company was founded in 1987. Under Kipp’s supervision, our company remains as one of the most reputable cleaning businesses in Regina. To this day, we continue to provide the great services that our customers have come to expect from us. We have 3 high-performance truck mount units for any environment. In addition, we have portable units for jobs that we can’t get to by truck. Since we established our business, we have had the privilege of cleaning more than 260 local restaurants. We are fully licensed and insured. Furthermore, we are certified by the Institute of Inspection Cleaning and Restoration Certification (IICRC). We can get to anywhere you are. We have 3 high-performance truck-mount units which are used in the hot water extraction process to clean, disinfect and deodorize your carpets and upholstery. We also have portable units for those jobs that can’t be reached by our van.